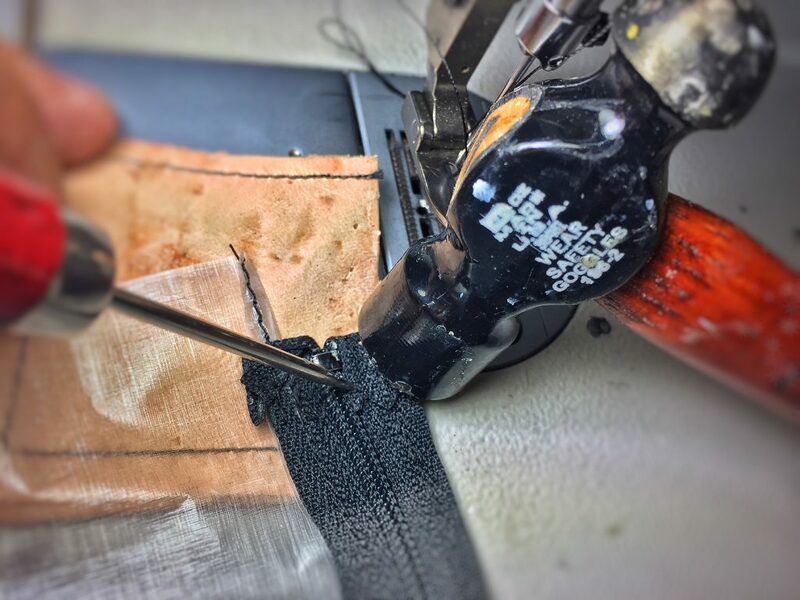 The zipper is one of the major components of the ride wallet and how it’s sewn onto the bag determines the overall construction of this cycling pouch and defines its inherent simplicity. 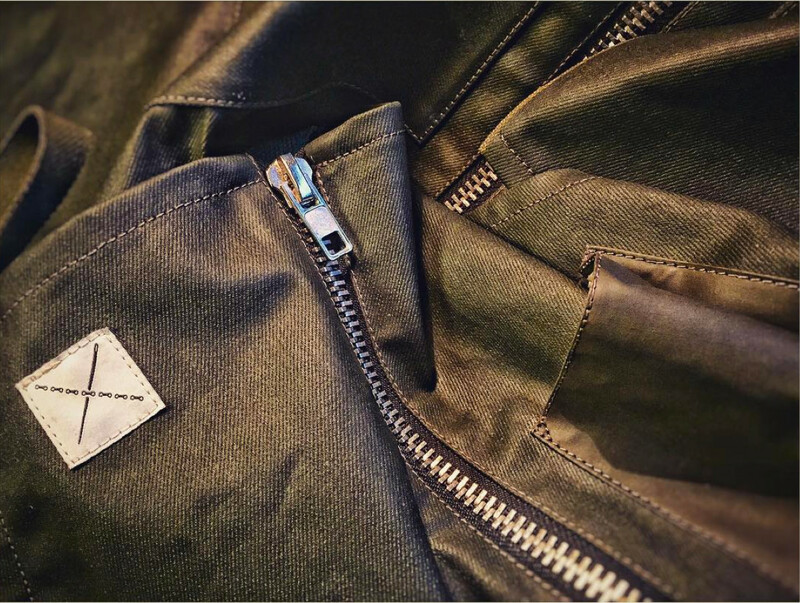 First, the zipper is attached to the outer shell along the length of the zipper but not along the entire length of the tape; it’s sewn onto the shell only along the edge of the zipper tape between the top and bottom limits of the stops. 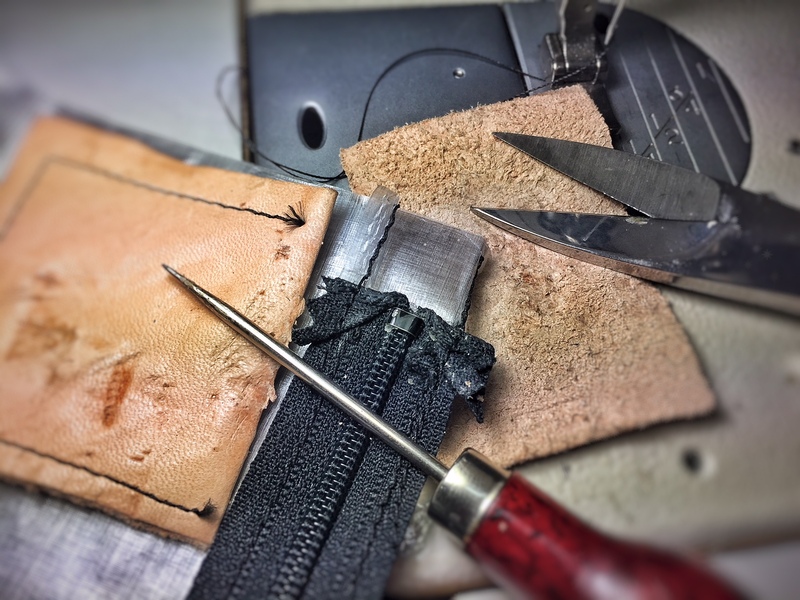 Then the loose ends are folded back and sewn down in a triangular shape so the jagged ends of the tape lie parallel to the sewn edge and essentially disappear under the finished seam. Beeswax is used to coat the end sections of the tape to add plasticity so the edges can be folded back flat. Waxing and hammering the tape helps to hold the shape so it can be sewn down with precision before Grosgrain tape is sewn on to complete the finished presentation and before top stitching. 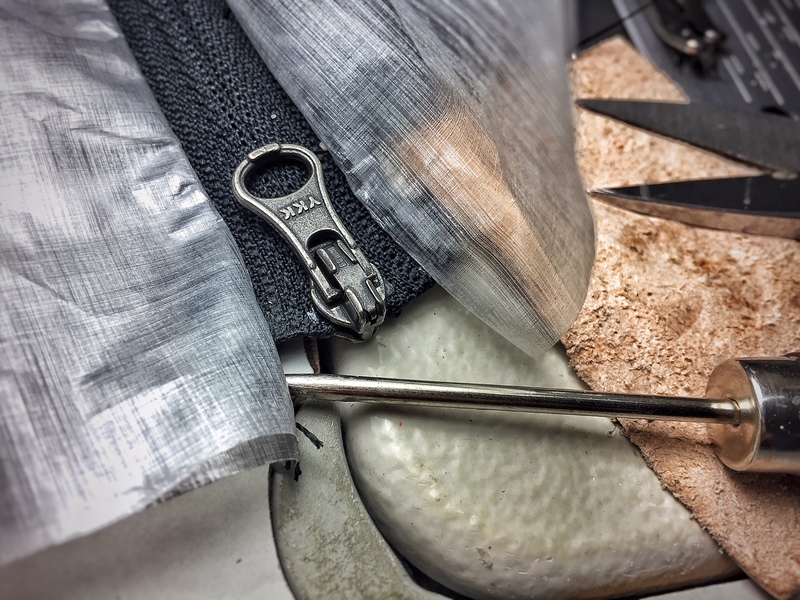 This bag uses a No.3 YKK reversed coil zipper. The coil zipper weighs about 5grams while the No.3 YKK Vislon weighs about 7grams (1gram =0.035oz). The coil zipper creates such an extremely light cycling pouch, although, I prefer the smoothness of YKK’s Vislon zippers. The coil zipper works well but the action has a little more “bind” to it. A cycling wallet isn’t intended to have all the functionality of a your everyday wallet. Its purpose is, simply, to provide a convenient place to hold your ride essentials; phone, cash, credit card, ID and maybe some boots for emergency repairs and it keeps everything dry. The internal divider creates two compartments and helps keep things organized. 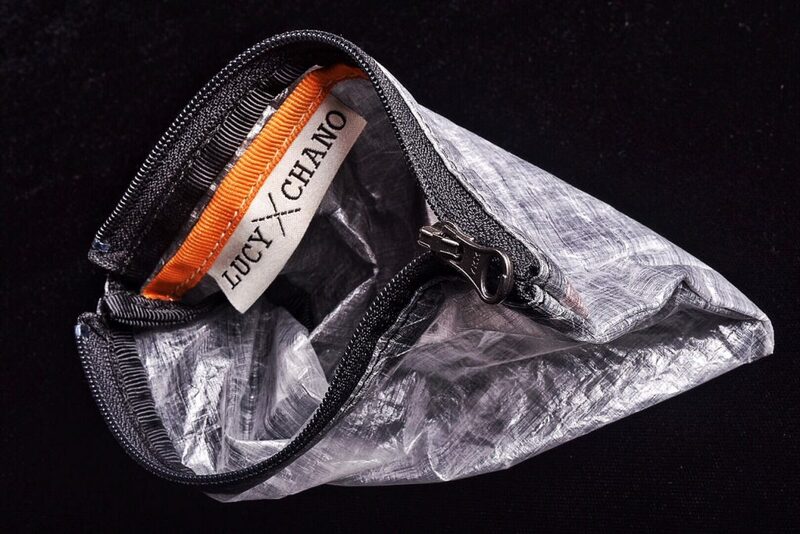 The cycling wallet is not intended to be used as a tool and/or inner-tube pouch. It’s a flat envelope; sleek and slim. Personally, I like to keep tools and such in a separate bag and we have plans for tool pouches and rolls designed with “volume” in mind. 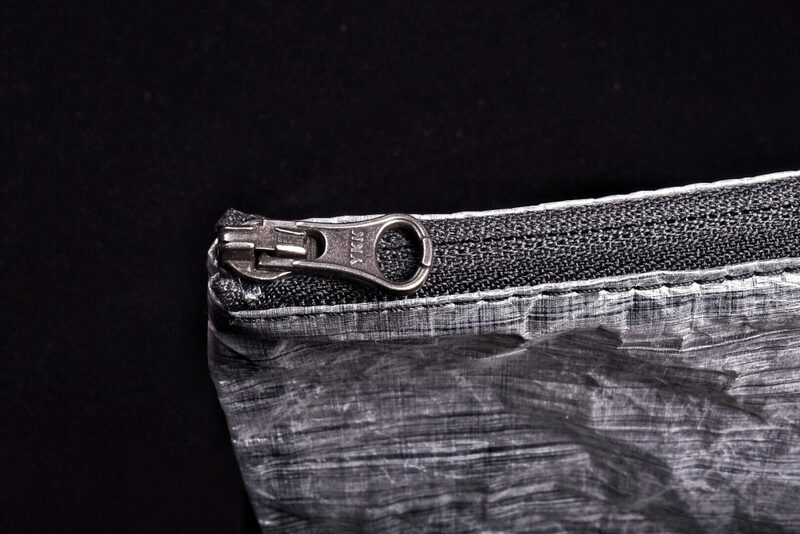 This cycling pouch is constructed from two weights of Dyneema composite fabric; .7oz for the outer shell and 1oz for the section that creates the interior compartments. Total weight: 10grams (.35oz). This is a Super Light Weight Ride Wallet. 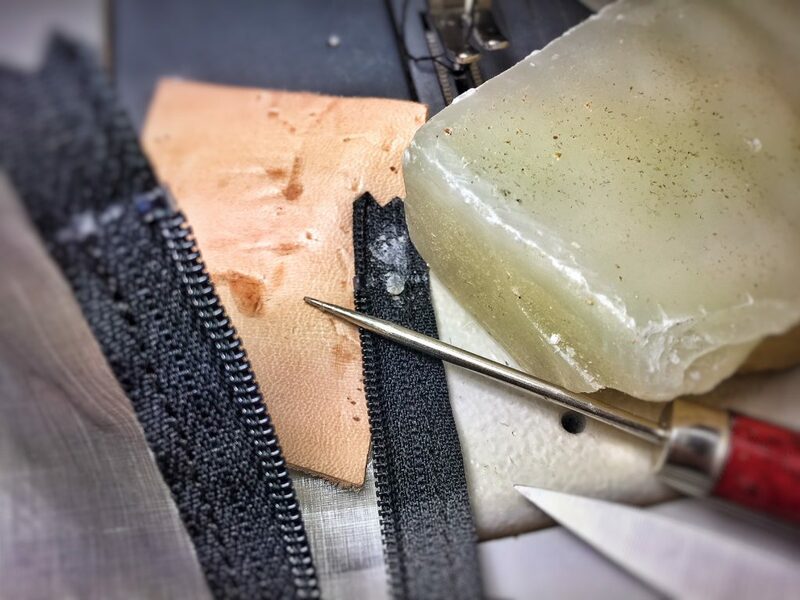 Applying Wax to the zipper tape. Light hammering creates a sharp edge. Folded back to hide the raw edge.